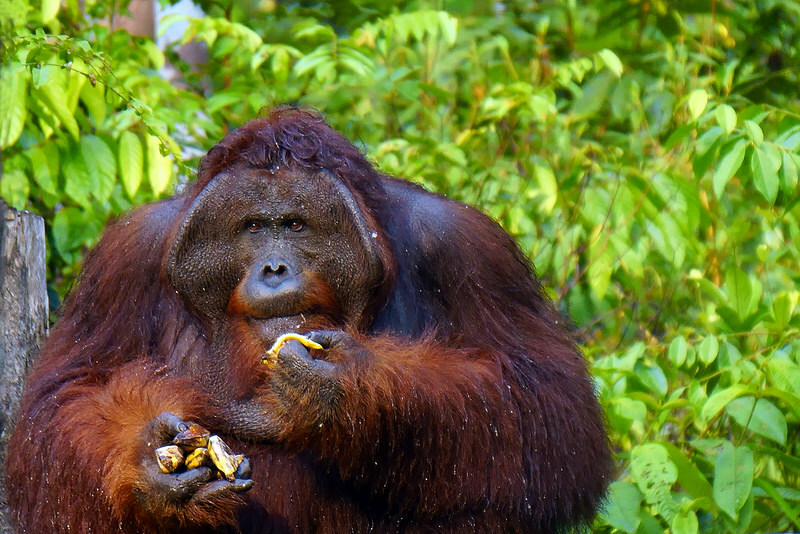 Join us on an original and all-encompassing tour of the ‘other’ BORNEO — Kalimantan. Over four weeks we will visit every province, several national parks and nature reserves, remote Dayak villages, sail the mighty rivers on houseboats, experience the diverse wildlife and birds, and visit the principal cities and towns of this seldom-visited region. Full services of an Out of Bounds Tours leader with local guides. We begin our Kalimantan tour on arrival at the Sultan Aji Muhammad Sulaiman Airport (BPN) in Balikpapan. In the afternoon, we will take a short flight to Tarakan, the only city in North Kalimantan province and borders the Malaysian states of Sabah to the north and Sarawak to the west. We will transfer to our hotel and have a welcome dinner. Overnight in Tarakan. After breakfast, we will drive to the port to board a speedboat for our trip to Malinau (3 hours). 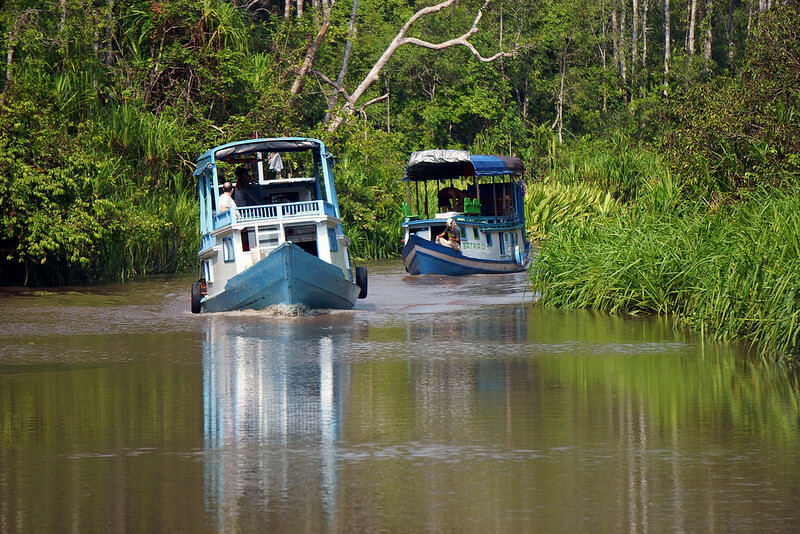 On the way, we may see some freshwater dolphins and proboscis monkeys along the delta of the Sesayap River. Upon arrival at Malinau, we will continue upstream if the water level is high enough by motorized canoe to Desa Setulang, otherwise we will travel overland by car. Upon arrival at Desa Setulang, we will tour the village and overnight at a lodge. Overnight in Desa Setulang. We will spend the next couple of days experiencing the traditional life of the Dayak Tribes around the village, and have ample time to trek through the tropical forest nearby to spot some animals like monkeys, and a wide assortment of birds, including hornbills and kingfishers. At the hills, we will have beautiful views of the forest around us. Overnight at a local house or jungle camp. This morning we will start our trip downstream back to Malinau by motorized canoe, further looking for more birds and wildlife en route while enjoying the peaceful surroundings. We will then continue to Tarakan. Overnight in Tarakan. We will venture around Tarakan this morning before catching our short flight to Balikpapan, East Kalimantan. On arrival, we will tour this clean, vibrant and cosmopolitan city. There are many beautiful beaches in this city, and it truly comes alive at night with very exciting markets. Overnight in Balikpapan. In the mid-morning we will head for the esteemed Samboja Lestari Park, where en route we will pass lush rainforest over muddy roads in a 4×4. After checking onto The Samboja Lodge, we will visit the lodge’s tower in search of wildlife and birds (Samboja is the best place in Kalimantan Borneo for birdwatching) and to have an overview of the park. Afterwards, we will see the orangutans and sun bears at a rehabilitation center that works to process them back into the wild. In the evening, there will be an optional nature walk to spot some nocturnal animals and birds. Overnight at the Samboja Eco Lodge. This morning on our Kalimantan tour, we will transfer to Bukit Bangkirai, where we can find several species of hardwood trees and visit a ‘Tree Top Hanging Bridge,’ with beautiful views over the Kalimantan Hills filled with emerald jungle and birds. After lunch, we will go to the Sun Bear Rehabilitation Center to learn about the rehabilitation process and the habitat of the sun bears and watch a feeding. 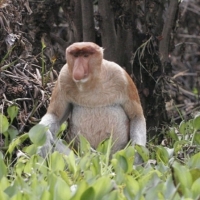 Later we will venture to the Black River to explore the surroundings for proboscis monkeys, birds and around the mangrove forest. Overnight in Samarinda. We head off this morning to the Pampang Dayak Kenyah village. The women here can still be seen with their traditional stretched ears and tattoo’s — one of the last memorable Dayak Culture signs in rapidly-changing Kalimantan. After lunch, we will drive back to Samarinda and visit the home industry of hand weaving sarongs and the old mosque, which is over 400 years old and the largest in East Asia. We will then transfer to Loa Janan and board our houseboat to start the exciting adventure along Mahakam River. Overnight on the houseboat. We will arrive at Muara Muntai and witness the villagers daily activities from the long wooden bridge which is made of ironwood, and then proceed to Mancong by motorized canoe crossing the Jempang Lake, where we will have the opportunity to view many migratory water bird species and the floating houses and fishermen. 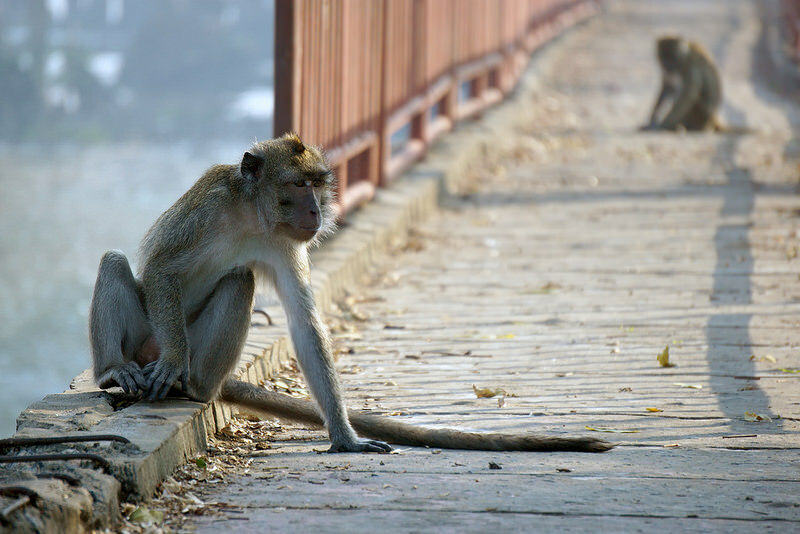 Later we will explore around Ohong River where proboscis monkeys, monitor lizards, and other wild animals are hanging around at the riverside. 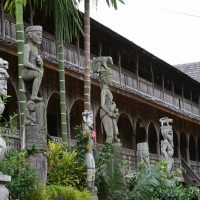 In Mancong, we will visit the exotic longhouses and see the daily life of the Benuaq Dayak. We will then return to the houseboat to continue cruising up the Mahakam River to Muara Pahu. Overnight on the houseboat. Arrive at Muara Pahu where we will cruise upstream the Kedang Pahu River by canoe for about an hour to Mount Bayan to visit Terbisak Dayak village, which still holds about 100 Dayak people living in their community longhouses and whom practice the age-old traditions of dry rise fielding and hunting. 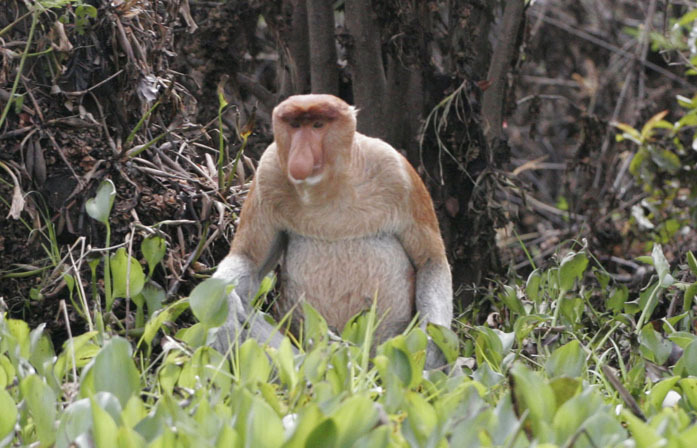 We then will continue downstream by canoe, along the river bank where we will expect to see a healthy amount of wildlife, such as otters, leaf and proboscis monkeys, proboscis monkeys and exotic birds. Later we will move to the delta region of the Belowan River, with opportunities to spot the freshwater dolphins in the colliding stream of the Kedang Pahu and the Bolowan River. In the afternoon, we will return to the houseboat to continue upstream to Melak. Overnight on the houseboat. Arrive in Melak and drive to Eheng, passing the beautiful highlands to reach the old longhouse of the Dayak Tunjung. Afterward we will visit Kersik Luway and explore the forest, where, if we’re lucky, we may spot the famous black orchid of the area as well as plentiful birds. In the afternoon, we will visit the Ombau Asa waterfall, an exciting place for swimming and relaxing. Later we will head back to Melak and board the houseboat to continue and downstream to Tenggarong. Overnight on the houseboat. After breakfast on board, we will arrive at Tenggarong, once the capital of the mighty Kutai sultanate, and visit the former palace of Sultan Kutai Kertanegara and see the impressive collection of heirlooms, ceramics, Dayak art and cultural items. From there we will continue our journey downstream to Samarinda and on arrival will have the evening at leisure. Overnight in Samarinda. We leave Samarinda and head into a landscape of villages and hilly/lowland forest scenery through Bukit Suharto and Samboja. Once in Balikpapan, we will take a ferry across the Balikpapan Bay to Penajam, which needs one-hour (excluding waiting time at the port). From Penajam, it is about two hours to Batu Kajang. This area of the drive is near the coastline with lots of palm trees, plantations, and villages. Overnight at in Batu Kajang. This morning we drive to Nagara village to see the traditional machete making, metal ware, and pottery home industries. We then continue our trip to the lake to observe the water buffaloes swimming and spend time around the villagers. Later we will proceed to Kandangan for having dinner at a local restaurant and then onto Loksado. Overnight at a lodge in Loksado. We will venture out to explore the legendary Kalimantan jungle today through a primary and secondary rainforest, hills, waterfalls, hanging and suspended bamboo bridges, village farmlands, rivers and cascades, longhouses, and cinnamon and rubber trees. 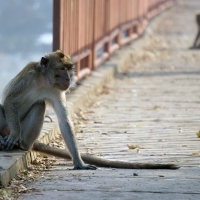 Birds and monkeys in the area are expected to be plentiful. In the afternoon, we will head back to the lodge on a different trail for further looks around this exotic region. Overnight at a lodge in Loksado. This morning we will set off for a day of adventure and go bamboo rafting around the gorgeous landscape of tropical rainforest and along the riverside. Later we will meet our mini-van downstream and then drive to Banjarmasin, first stopping at the Benua Raya village to see water buffaloes as well the villagers’ activities around their stilt houses — the best time for this is around sunset, at 6pm, so we expect to arrive in Banjarmasin at around 11pm. Overnight in Banjarmasin. Early in the morning, we will head to the floating market to explore the unique culture of Banjarese that trade commodities from boat to boat. 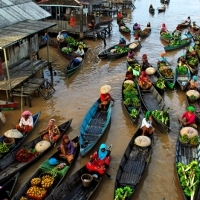 We will then return to our hotel crossing the Banjarmasin River while having excellent photo opportunities of life around riverside. In the afternoon, we will visit the Nyaru Menteng Orangutan Reintroduction Center and then take an optional short hike up to Tangkiling Hill to admire the stunning landscape and the sunset. Overnight in Palangka Raya. This morning we will head to the Tangkiling port to catch our boat for a cruise on the natural black river of the Rungan River. Along the way, we will be keeping an eye out for various monkeys and birds that live in the area before arriving at Orangutan Island, which is managed by Borneo Orangutan Survival Foundation for rehabilitation before released into the wild. Later we will make a roughly three-hour drive crossing the beautiful landscape of Meratus Mountain to the town of Sampit for dinner in a local restaurant. Overnight in Sampit. After breakfast, we will drive to Kumai sub-district to board our houseboat to Tanjung Puting National Park, a highlight of our time on the Kalimantan tour. The houseboat is a traditional wooden riverboat with a roof forming the upper deck where you can view the rainforest as it glides by. The boat crew includes a captain, cook, and expert guide. 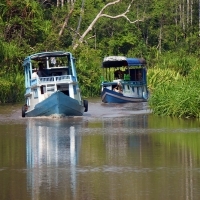 In the afternoon, we will slowly explore the quite river while observing the primates and bird life along the riverside. Overnight on the houseboat. After breakfast, we will board the houseboat for cruising upward to Pondok Tanguy to explore the rehabilitation center of the new ex-captive orangutans. Next, return to the houseboat for sailing upwards the creek to Camp Leakey where the older orangutans are re-introduced into the rainforest. At this station, you will have the opportunity to trek into the rainforest with a naturalist guide and forest rangers to appreciate the flora as well as viewing wild orangutans, gibbons, macaques, and birds. 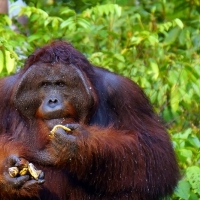 In the afternoon, we will visit the feeding station to see orangutans feed. We will then sail back down the river and overnight on the houseboat. We will venture out this morning on a safari to explore wildlife along the riverside. Next, we will travel to the Kumai district by boat, before driving Nanga Tayap across the beautiful landscape and verdant rainforest. Overnight in Nanga Tayap. This morning will pay a visit to the Sungai Luar village to explore the beautiful rock hill named Bukit Daya, which is part of Gunung Palung National Park. Later we will drive to Tayan, crossing the rainforest, a Dayak village, and the mighty Kapuas River. Overnight in Tayan. We will drive to Saham village, of which dozens of families stay in a longhouse roughly the length of 180 meters. Next, we will proceed to the Tomb of Juang Mandors, the cemetery of the mass murder of about 10,000 people during the Japanese occupation between 1942-1945. Afterward, we will drive to Mempawah for a panoramic tour. Overnight in Mempawah. After breakfast, we will proceed to Rindu Alam Hill to see the peak with views of the beach, islands, and rainforest from above. Then we will head Gunung Poteng for a trek into the primary forest with the hopes of seeing the famous Rafflesia flowers and many birds and monkeys. 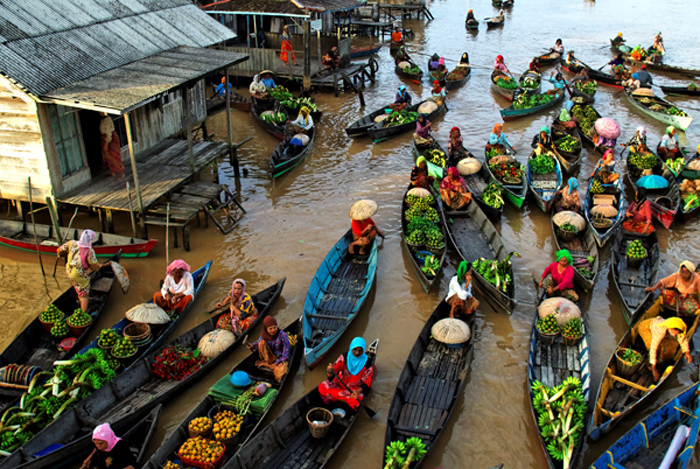 Afterward, proceed to Singkawang to explore the city, which is known as the Chinatown of Kalimantan. Overnight in Singkawang. We will have a relaxing breakfast at our beach hotel before traveling to Teluk Suak to catch the public boat to Pulau Lemukutan. At this island we will have various activities available including snorkeling to explore the beautiful sea garden and sightseeing on the beach, or wandering around the interior. Overnight in a cottage on Pulau Lemukutan. Today will be a day to fully enjoy the beauty and natural wonders of Pulau Lemukutan. Activities include snorkeling in the marine gardens, exploring the clove plantations on the island, sailing around on a traditional fishing boat, visiting with some of the 1,000 residents on the island, or just simply laying on the beach and relaxing after a rewarding and challenging last few weeks of travel. Overnight in a cottage on Pulau Lemukutan. In the morning, we will leave the island and head back to Teluk Suak to catch our van to drive to Pontianak, the largest city in Kalimantan. After dinner, the evening will be at leisure to explore this fascinating town. Overnight in Pontianak. After breakfast at the hotel, we will have a comprehensive tour of Pontianak, which is situated on the banks of the Landak and Kapuas Rivers. Therefore the best way to explore the town is by rivers. Rivers plays an important role in the local community. 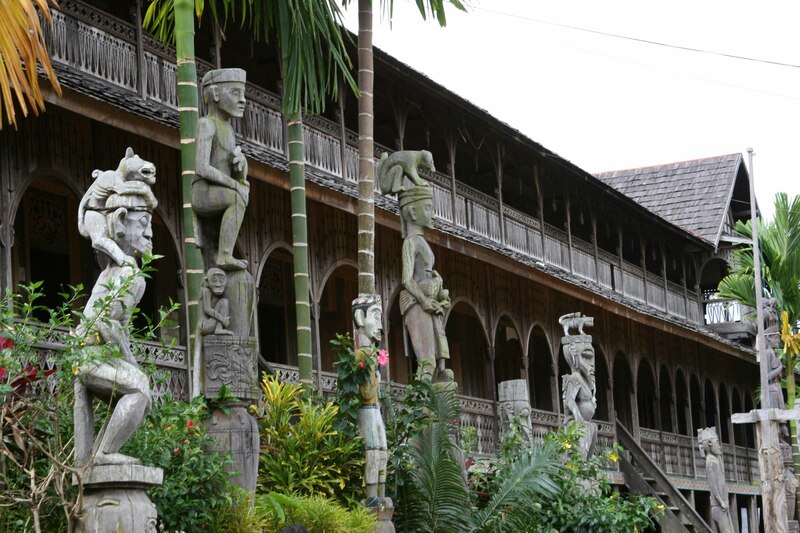 We will start by visiting by car the state museum, which exhibits the culture of the people of West Borneo. Next, we will journey up the Kapuas River by boat to Kampung Kapur, where traditional fish-farmers run their daily lives. Later we will continue to Kadariah Palace, Chinatown, the Grand Mosque, Masjid Jami, to the Equator Monument, and finally end in Tamun Alun Kapuas, where a huge number of local people gather in the afternoon and late evening. A farewell dinner will be served, and we will catch our final sunset in Kalimantan after a fantastic journey. Overnight in Pontianak. We will enjoy our final breakfast together, and then transfers will be made to the Pontianak airport for our onward flights.